10 interesting bridges timeline in a fun online history learning game. 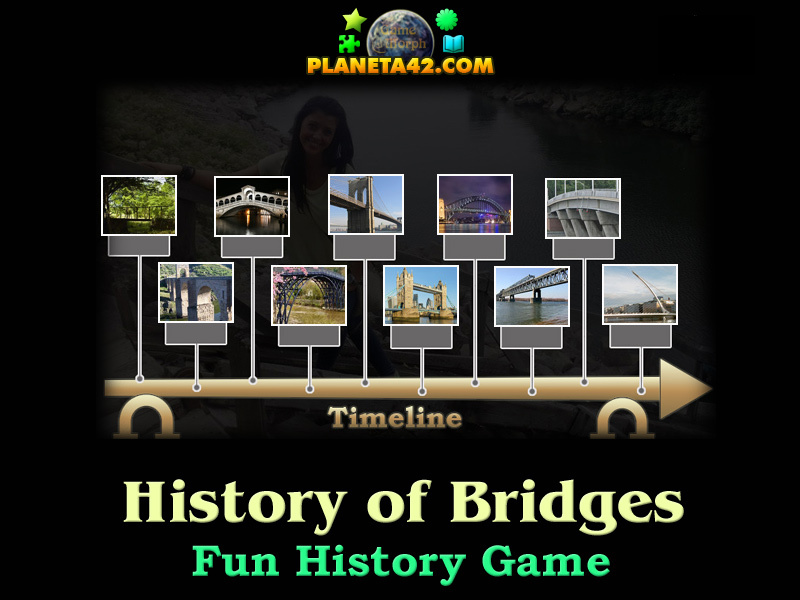 "History of Bridges Game" is a small knowledge level game, to sort 10 bridges chronologically. Free online game for desktop computers, laptops and tablets, which may be played in the web browser. History game about the bridge architecture through the years, suitable for online lessons and interactive classes. Minute to win it game. How to play History of Bridges Game. There are 10 bridges, situated on the top of the screen. Drag and drop them in the correct location on teh timeline. If dropped incorrectly, the pictures will go back to their original place. There is a small counter to the bottom right. It is, as always, used only for evaluation in fun classes. Know at least 2 famous bridges and get +1 Knowledge Level. Class subject: History of Bridges. Labels: History Games , Learning Games , Puzzle Games , Architecture Games , Education Games , Free Online Games.